There has been a lot of talk about digital content in Spanish-language publishing over the past three years, and publishers have started the e-book ball rolling with major digitization and e-distribution initiatives, but one key link has still been missing: the final retail connection with the consumer. The booksellers in Spain seem to be dragging their heels, and so far no big online retailer anywhere in the Spanish-speaking world has had the e-commerce chops to put all the pieces together — reliable content + big selection + ease of purchase. Now we have our first big-time Spanish-language e-bookstore and it comes not from Barcelona or Buenos Aires but . . . New York? What is this? A major online bookseller hawking e-books from an international cast of publishers and it’s geared toward readers in . . . the US? That notoriously close-minded, navel-gazing market? Believe it or not, that’s the truth of it. When we last spoke to Patricia Arancibia, International Content Manager at Barnes & Noble, she was busy talking to publishers from all over the world at her first Frankfurt Book Fair. Last Thursday, all that hard work bore fruit with the launch of the first dedicated Spanish-language e-book store in the US — and arguably the most complete Spanish e-book retailer to date anywhere in the world: NOOKbooks en español. NOOKbooks is working with a range of international partners to supply its e-books en español, from major digital platforms like Libranda and Grupo Urano, but also smaller houses like Editorial Vestales, a small romance publisher in Argentina. Some of these indie houses have just two or three people. At launch, the prices in the NOOKbooks store attracted the immediate attention of online commenters, both from readers — who were thrilled about the accessible ​pricing — and others concerned about the erosion of value in the book market. The store has gotten off to a good start, but Arancibia acknowledges there is still room for growth and improvement. 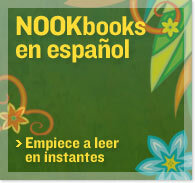 The NOOKbooks en español site is integrated into the English side of BN.com, for example, and while searches for author names turn up both Spanish and English titles, searches for Spanish terms don’t always pull up the right results. “The search I think was working very well, but we are definitely working on making it better,” says Arancibia. DISCUSS: Could the US Co-opt Global E-book Sales?